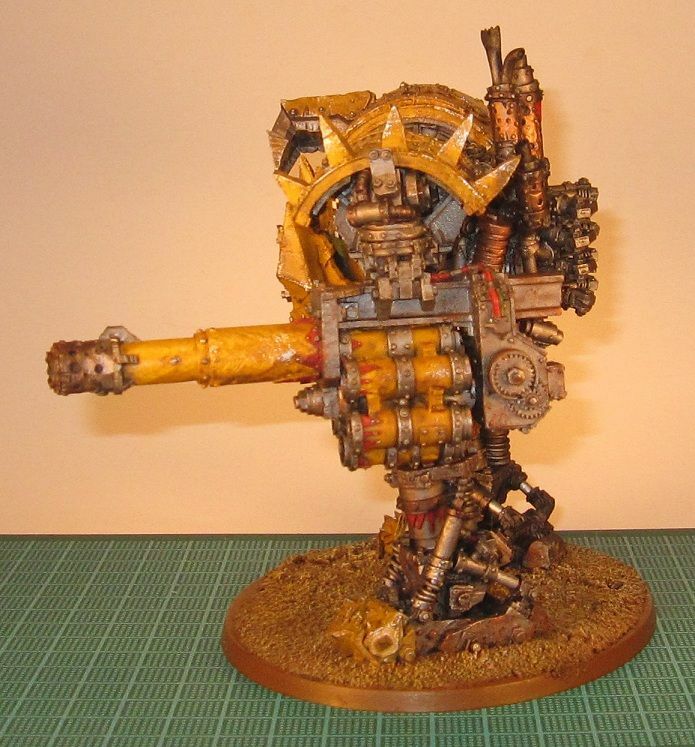 I have finished my 40kFC Painting Challenge Project for the month of October, my Ork Mega Dread. I like the way he turned out. 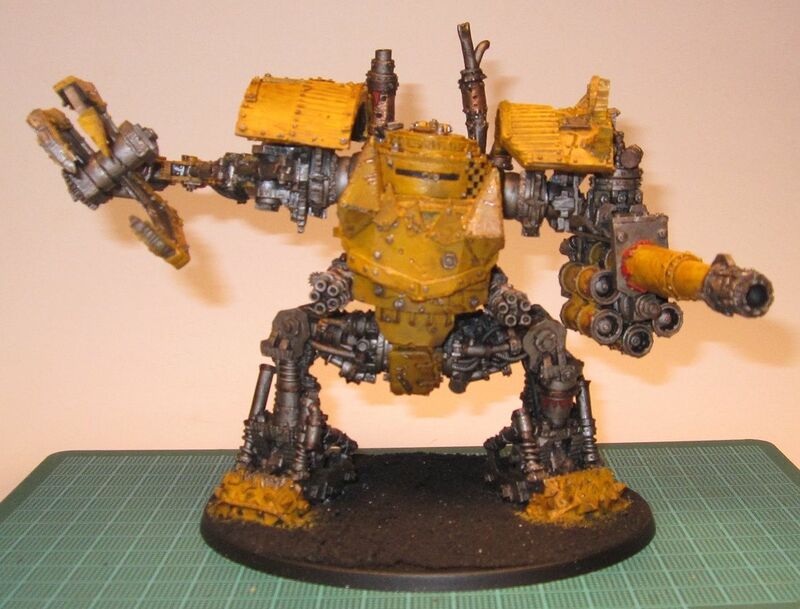 I'd like to give thanks to Mart (if you have not seen his Ork stuff, it is worth checking out) for the idea of sponging some Chainmail and Tin Bitz onto the yellow that helped put the final touches on it. 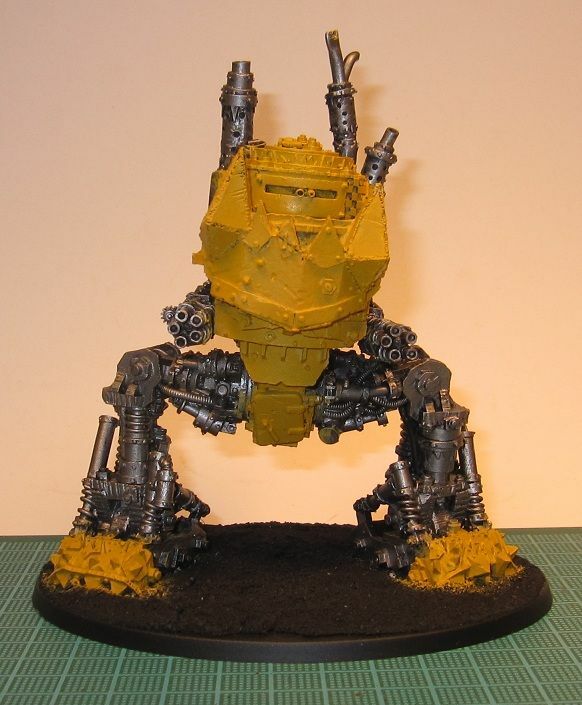 Next month's project is Painter's Choice and I am choosing my Ork Meka Dread. It's been a great week for getting painting done. So far I have got three projects finished, with a couple more that are close to being finished. First up, the Daemon Prince Mamon and Herald of Nurgle. I have to say, I love the Mamon model. It is just chocked full of great little details. 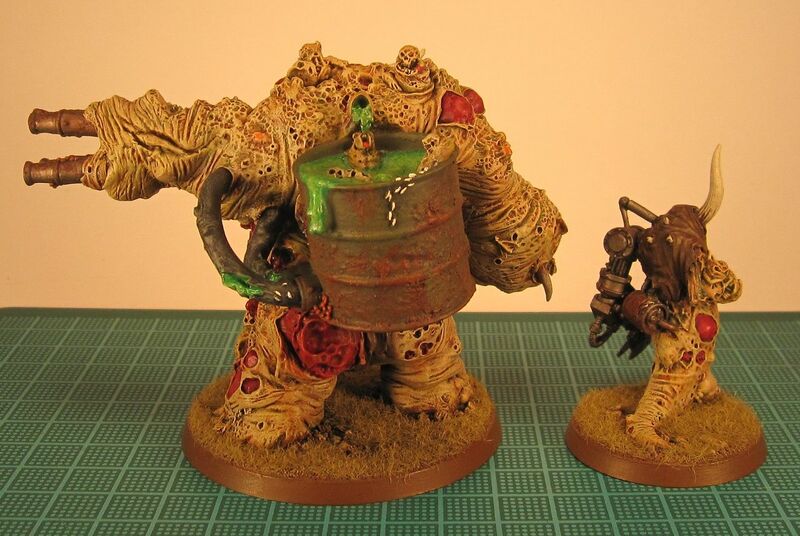 The Nurglings bathing in the barrel on his back are my favorite. 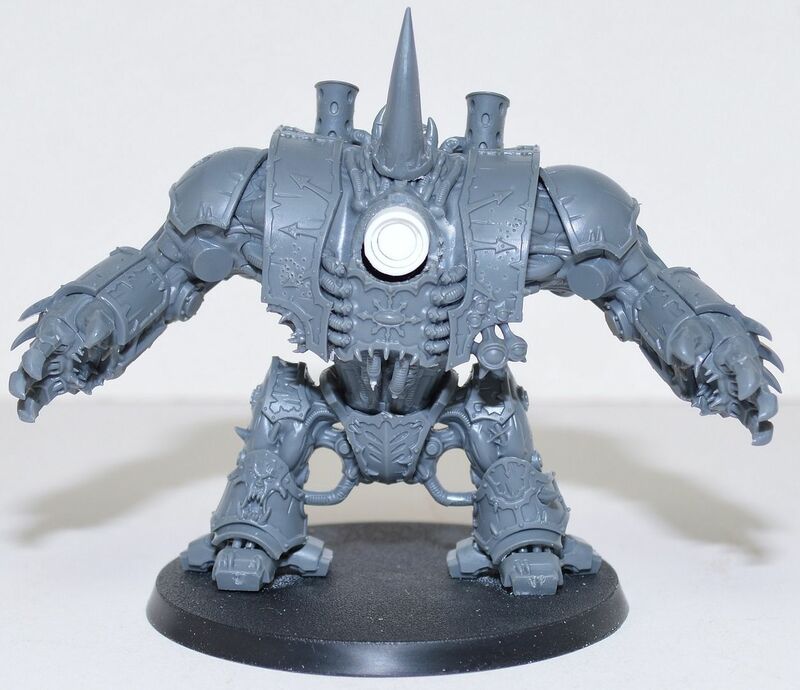 The model is also a lot larger than I originally thought, as seen in comparison to this Chaos Space Marine. If a CSM is seven feet tall, Mamon must stand around 18' tall and has legs the size of tree trunks. I cannot wait to get Mamon on the battlefield. 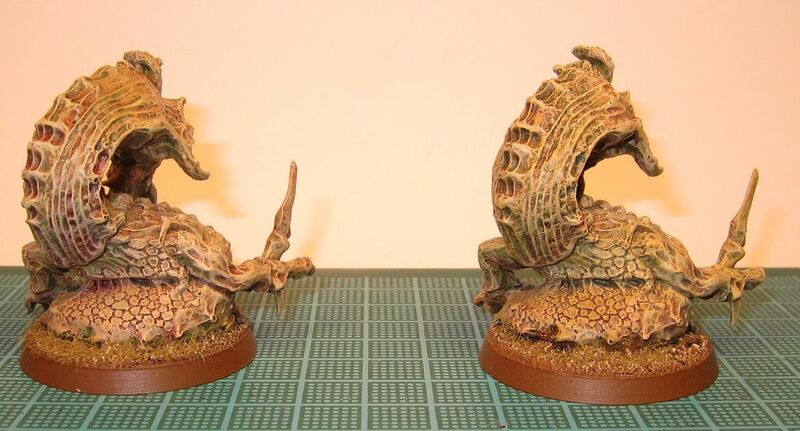 Also finished are my seven Nurgling bases. It is hard to say if I will ever use these little guys, but my army would not feel complete without them. Finally, and although not finished yet, here is my planned Chaos Space Marine color scheme. This is not my best paint job ever mainly because I was painting and re-painting it to get the color scheme I wanted. Anyway, what do you think? I feel I am finally done customizing my Plague Hulk, but I am going to save painting it for the Tale of Four Gamers that I am in. I will lose a point for it already being assembled. I will probably paint it for Period 2. 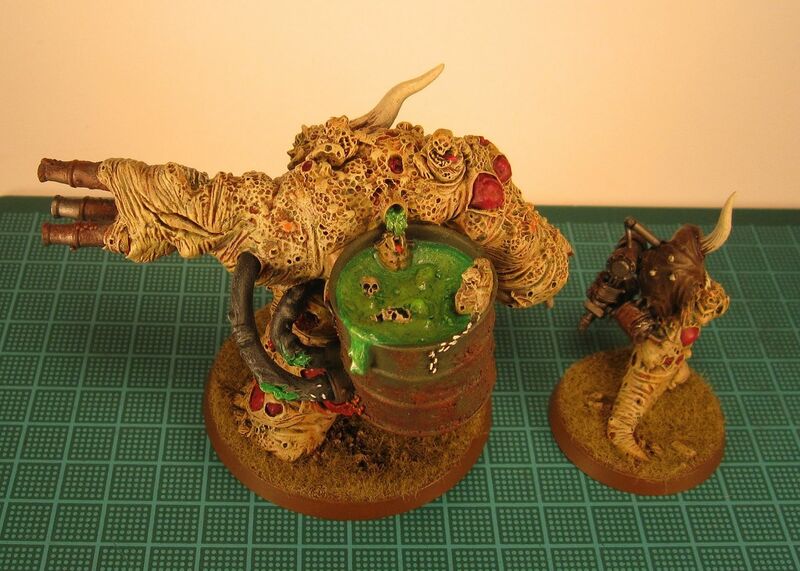 Last week, my latest purchased arrived, the Nurgle Daemon Prince Mamon and Herald of Nurgle. I primed them yesterday and started painting them. I must say that these are two awesome models. They are nice additions to my army. I also put together seven Nurgling bases last week that I found I still had not assembled. They are primed and ready for painting. And finally, my test Chaos Space Marine model is assembled, primed, and I started painting him last night. Lots of projects, but I think I can get most of them done this week. A couple of members of my local gaming club and I are going to be starting a Tale of Four Gamers (ToFG) on November 5th. 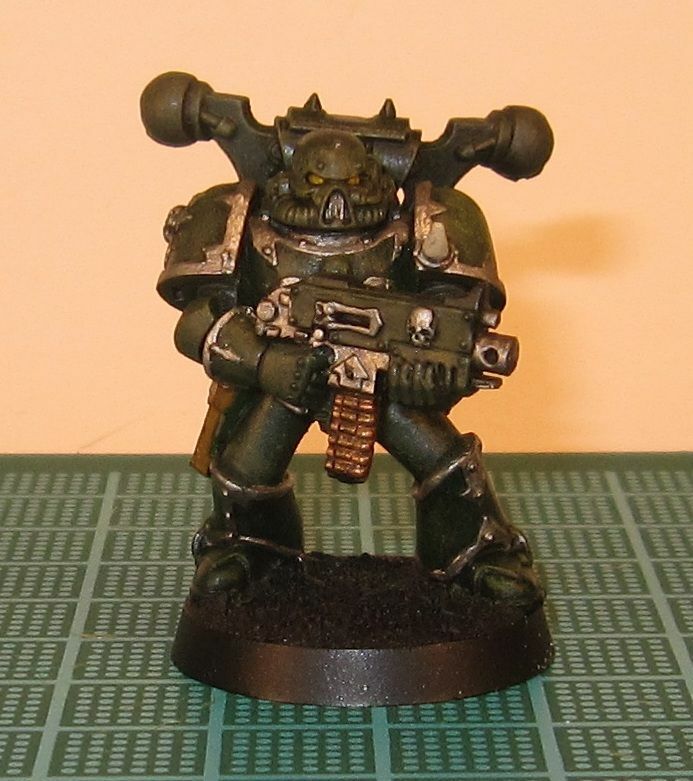 I am going to be doing my Chaos Space Marine army. I was originally going to make a Death Guard army, but I think I am going to just make my own CSM chapter that mainly focuses on Nurgle, but will allow me to field a non-Nurgle army if I so feel like it. I have a couple of chapter names I am toying around with and will probably post a poll at some point so you can help me choose. The contest will consist of four periods. In each period, each player must paint 500 points for their army and one themed objective marker. Each period will be four weeks to build and paint your army and one week to play your games. After each period, players will vote for which player has the best painted army and the winner of the vote will get an extra 5 points. For period one, your army must include one HQ and two troop choices. The first period battle will be a four-way game since the armies are only 500 points. The player with the most points at the end of period four wins. With only 15 models to paint in the first period, I should be able to get it done pretty quick, allowing me extra time to really Nurgle-up the Daemon Prince. 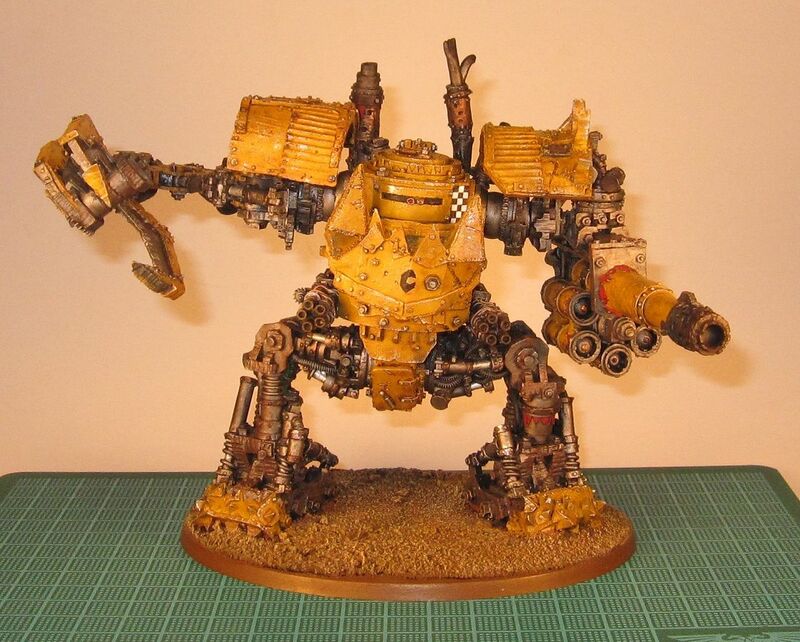 It looks like I may spend some time painting on my lunch hour because I also have to paint my Ork Meka Dread in November for the 40kFC Painting Challenge. I am going to put together one Chaos Space Marine to paint a test scheme on this weekend. 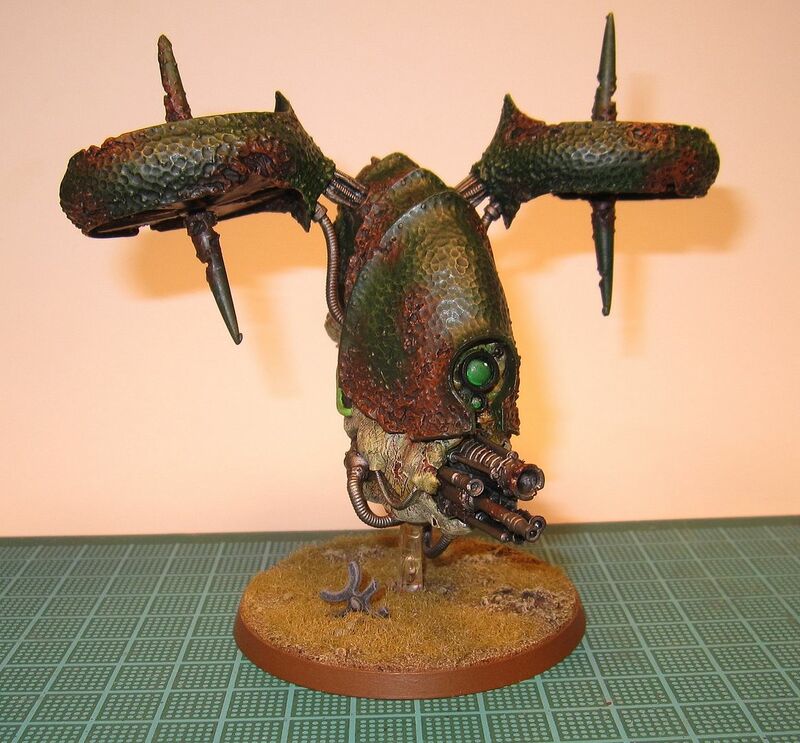 It will have to match my Blight Drones that are already painted, so the base chapter color will be Dark Angels Green. After my game last Thursday night, I got to thinking how I could get my Nurgle Daemons up to a decent 2500 point list. I am about 100 pts short. Fortunately, I have had the following model in my bit box for a while now. I got this model in a trade a while ago. The guy I was trading with just threw it in because he did not want it. 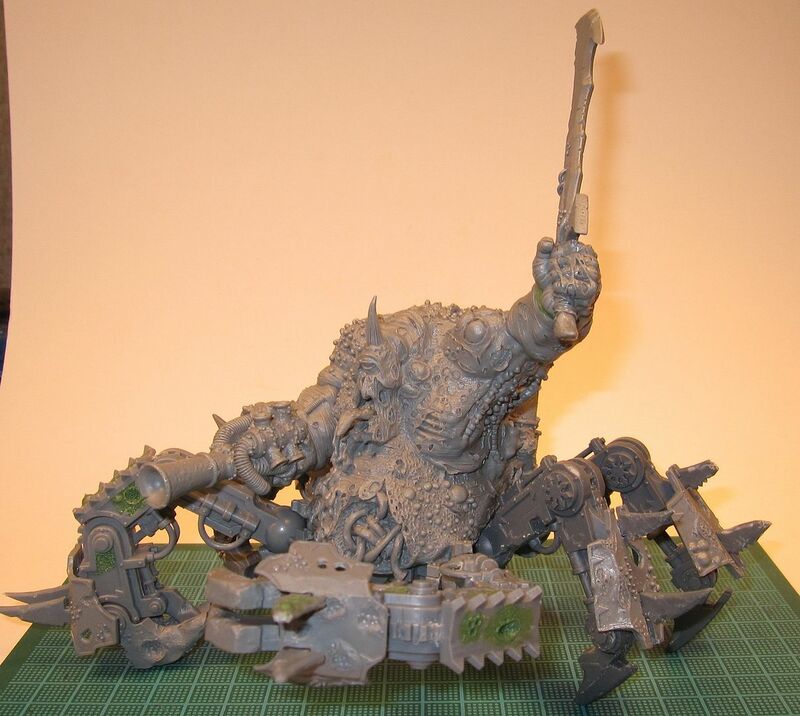 I did not know what it was until just recently and it turns out it is the Warmaster Greater Daemon of Nurgle. 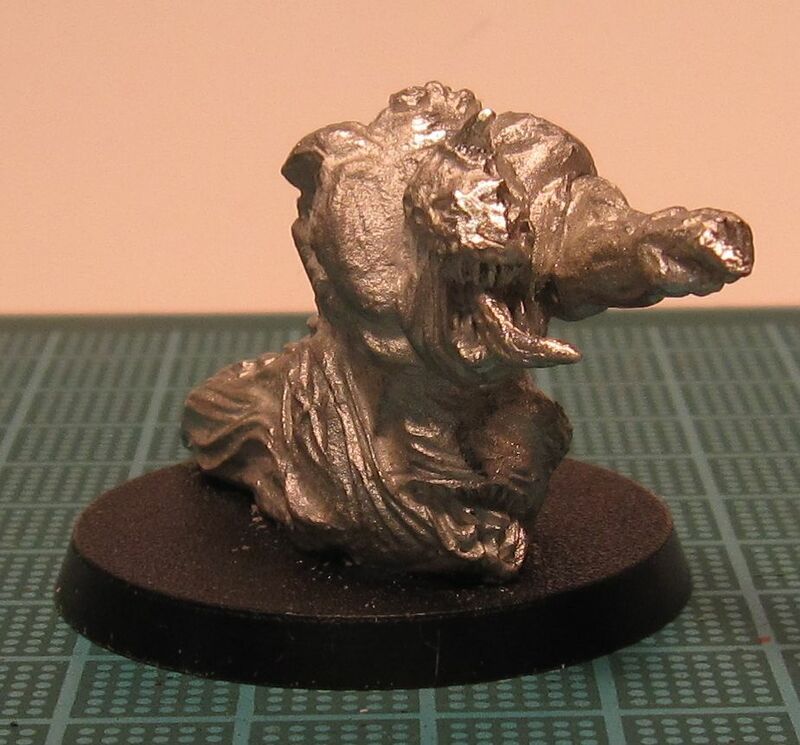 I mounted him on a 40mm base and I plan to make him into a Herald of Nurgle, which could easily use up 100 points. At first, I though the model might be a bit small, but I think it will work. 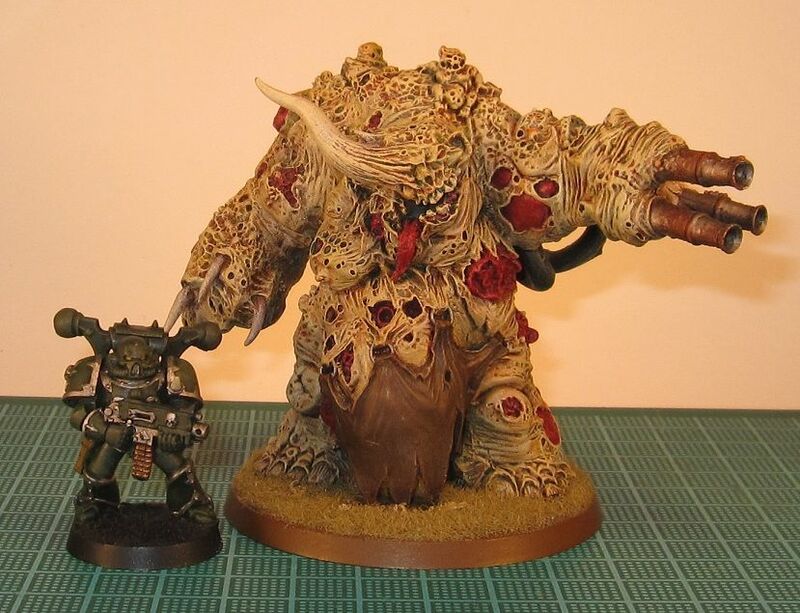 Here is a size comparison with a regular Plaguebearer. 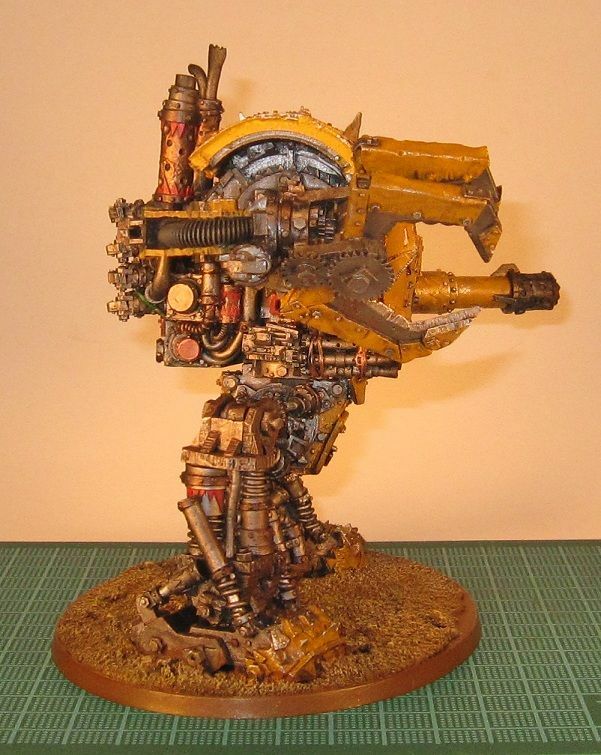 As you can see, it is shorter than a Plaguebearer, but more than makes up for in in sheer mass. My only problem now is to decide what to equip it with. At first I thought a Chaos Icon would be the way to go, but I am thinking that Breath of Chaos would be a better option. It would add some offense, as well as a template weapon, to any unit it joined. Unfortunately, the model is missing an arm, so I will have to model something for this. 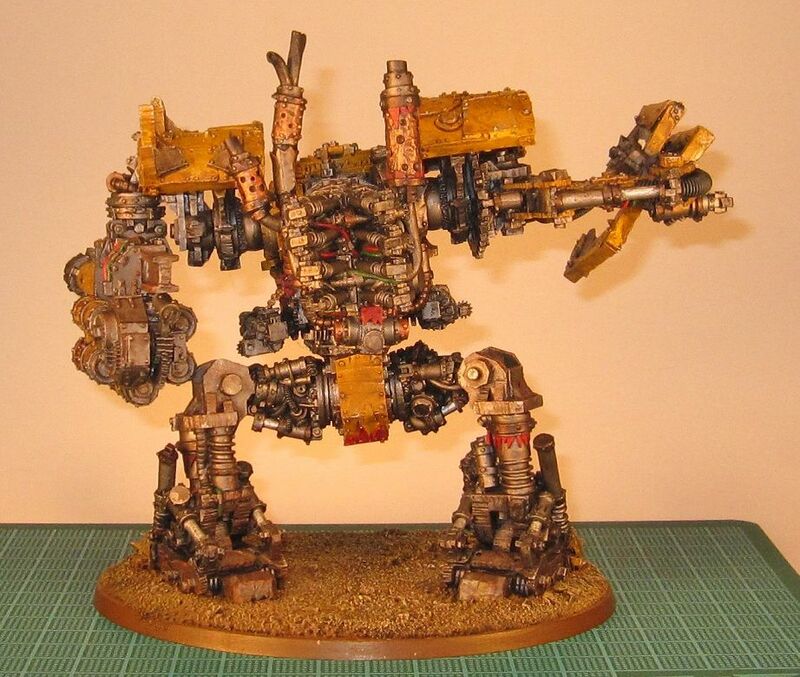 On the Ork front, work continues on my Mega Dread. Here is the latest WIP picture. This was my first game against the new Space Wolves codex and they were pretty much what I expected. While I do not plan to write out an full battle report, I wanted to write down some of the more memorable parts of the battle. The mission was Annihilation and the deployment was Dawn of War. My opponent won the roll to see who goes first and he deferred. My GUO, Epidemius, two units of Plaguebearers, and one of the Blight Drones hit the table on turn one. My Opponent held everything back during deployment and brought it all onto the table on turn one. One of the units of Plaguebearers got shot up and then assaulted by Ulrik and 5 Terminators because they were on his side of the board when they deep striked. Njal used JotWW on the GUO, who amazingly made his Initiative test! The GUO then lost a wound to a unit of Long Fangs. On turn two, the GUO assaulted the unit of LFs and proceeded to eat three of them. 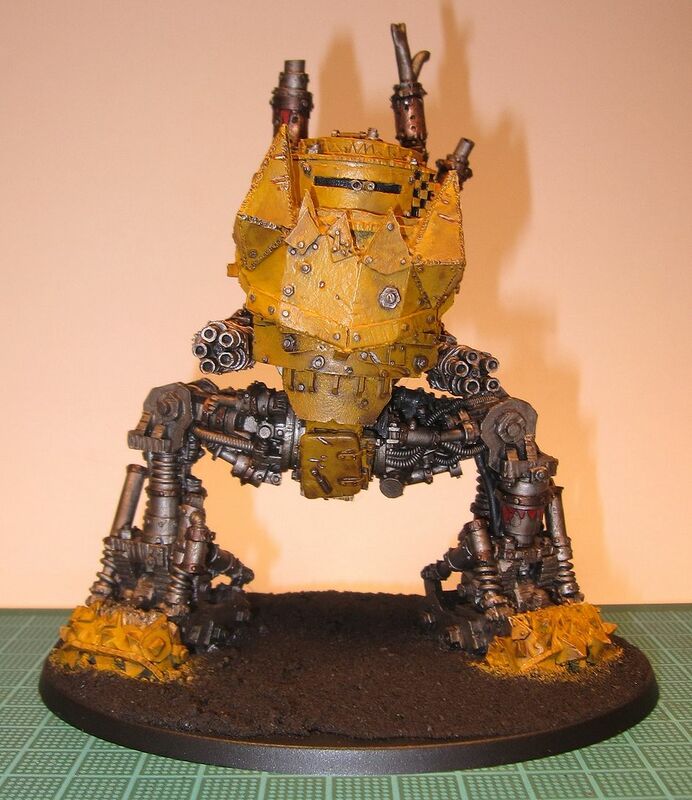 The GUO won combat since the LFs failed to get any wounds through its defenses. Njal joined the LFs in the assault of the GUO on his turn two. The LF again failed to get any wounds on the GUO but Njal got one through. The GUO got one wound on Njal and ate the last two LFs. On Turn three, Njal got two more wounds on the GUO and the GUO proceeded to eat Njal, ending the combat. Meanwhile, the Ulrik and his Terminators managed to kill off two full units of Plaguebearers, half of a third, and all seven Beasts. However, on the last turn, the PBs managed to kill off Ulrik. That was a vicious unit. The Plague Hulk was immobilized when it landed in a river and was immediately immobilized, but managed to Vomit on some Grey Hunters. The Plague Hulk survived two shooting phases by Meltaguns thanks to his 5+ Cover save, but died to a power fist. Even though I lost, it was still a fun, hard fought game. Before this, I had feared the JotWW and I still do. It helped a lot that the GUO survived this power, otherwise I think it would have been a much different battle since the GUO was the one that killed Njal. Last night I had my first practice battle for the upcoming tournament that I will be playing in. It was against Eldar and it was the weirdest game of 40k that I have ever played. I know I said that I was going to play this list, but I decided to play the following list instead. I went with this list as two-thirds of the time I would be playing objective based missions, so the three smaller units made sense. As it turned out, my first practice mission was Annihilation! The deployment type was Pitched Battle and I won the roll off to go first and deferred. My opponent kept everything in reserve. On my turn one, I got my GUO, two units of Plaguebearers, and my Blight Drone. My opponent's turn two saw NONE of his reserves enter play. My half of turn two I got one unit of Plaguebearers. Here it was entering turn three and no shots had been fired and no models had been removed. It was crazy. Turn three saw the arrival of two Wave Serpents filled with Dire Avengers and one Farseerer, a Falcon, and a unit of three Guardian Jetbikes. Everything of his shot, mostly at a unit of Plaguebearers, and missed with everything. My turn three saw the arrival of the Beasts and Plague Hulk. My Plague Hulk and Blight Drone tried to crack one of the Wave Serpents and both failed. On turn four, the unit of Dire Avengers with the Farseerer disembarked close to a unit of Plaguebearers. The Farseerer cast Fortune on the Falcon and Doom on the unit of Plaguebearers. The Dire Avengers Blade Stormed on the Plaguebearers, but thanks to their high Toughness, Inv. Save, and FNP, only five were killed. On my turn four, the Daemon Prince arrived and came half an inch from DS off the table edge. He used his Daemonic Gaze on the unit of Jetbikes, but since they had Turbo-boosted in the previous turn, they all made their Inv. Save. My Blight Drone shot its Phlegm attack at the Wave Serpent from which the Dire Avengers disembarked from, wrecking it and killing six Dire Avengers. The five remaining Plaguebearers attempted to assault the Dire Avengers that shot them the previous turn, but only rolled a two for the Slow & Purposeful and failed to assault. Turn five was the most exciting. The Farseerer cast doom on GUO. His second unit of Dire Avengers that disembarked that turn Blade Stormed the GUO and managed to get one wound through the GUO's Inv. Save and FNP. One of the units of Jetbikes shot at the GUO but no wounds got through; the other Jetbike unit shot and killed three of the five remaining Plaguebearers. The Farseerer and Dire Avengers assaulted the two remaining Plaguebearers, killing both of them. On my turn five, the Daemon Prince used his Daemonic Gaze on a unit of Jetbikes and killed all three. The GUO released his Aura of Decay around the other Jetbike unit and the Dire Avenger unit but only one Dire Avenger was killed. The GUO then assaulted the unit of Dire Avengers. The Dire Avengers managed to get one wound on the GUO, but the GUO killed three Dire Avengers, breaking them and they ran off the table edge. The Beasts assaulted the Farseerer/Dire Avenger unit. The Beasts suffered one wound and failed to kill any Dire Avengers who all made their Armor Saves. The game ended on turn five with me winning 3-1 in kill points. I am really looking forward to using this army in the tournament and to getting in more practice games. It was a productive weekend this last weekend. I was able to get lots done. I completed my Second Blight Drone and my last two Beasts of Nurgle. On this Blight Drone, I decided to paint the rust darker than I did on my first one and I also gave the armor plating a wash of Devlan Mud. Unfortunately, the wash undid my drybrushing highlights. I still think it turned out really good. I painted the eye lens green on this one instead of red to differentiate between the two. I really love this model and at some point I am going to need to get my third and final one. I know I did not pick out any details on the beasts, but this is how I painted my previous five beasts. I envision them as shapeless mounds of dead, rotting flesh taking form into a beast. Not very special, but I like them. These two complete my full unit of seven beasts. I am glad to be done with these beast models, they are horrible to put together and the gaps that I had to fill with green stuff was just ridiculous. 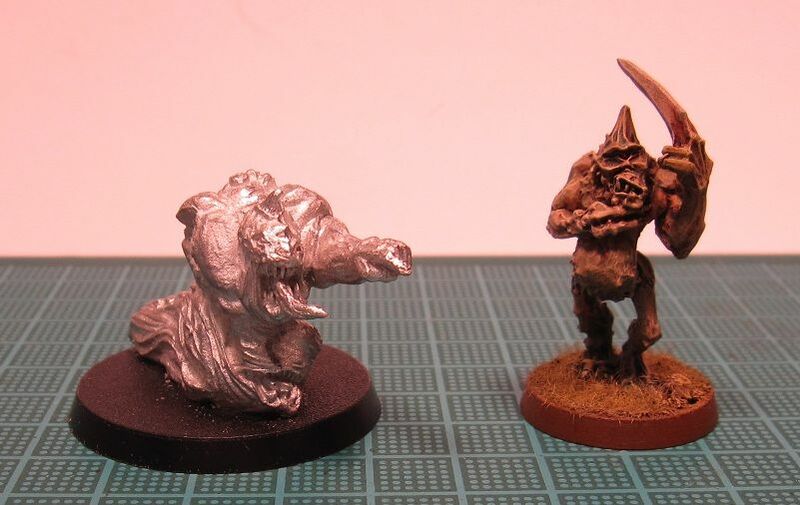 If GW ever releases new ones, I hope they are better than these. As for my other projects, I am slowly making progress on my Plague Hulk. At some point I am going to need to stop 'Nurgle-ing' up the legs; it seems like I could continue doing this forever since it is very time consuming to do all these little details. However I do not feel I am done yet. I will need to be done soon before I loose the good weather for priming. I have done more painting on Epidemius, but I am not happy with the way he is turning out. I think that is why I stopped painting him the first time. Not sure what to do here. I have also got some painting on my Mega Dread, here is a WIP picture. I need to get these projects finished as I am really itching to get to work on my new winged Daemon Prince and my Chaos Marine army. I spent most of my free time cleaning and organizing my hobby area this weekend so I do not have much to report. 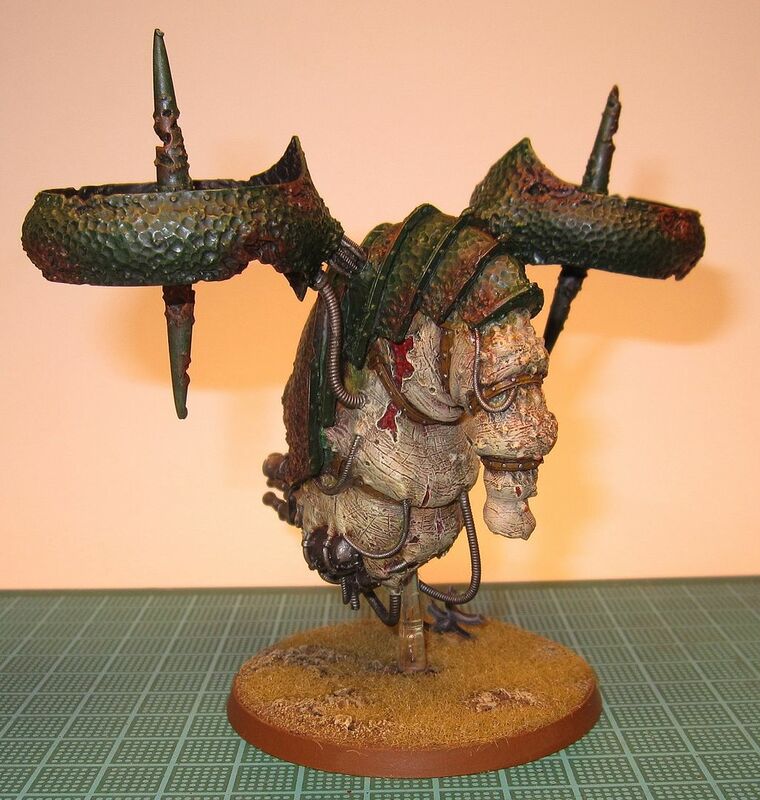 I also spent a bit of time going over my current Nurgle Daemon army and what I still have left to do on it. While everything is mostly done, I still have some unfinished models to complete. 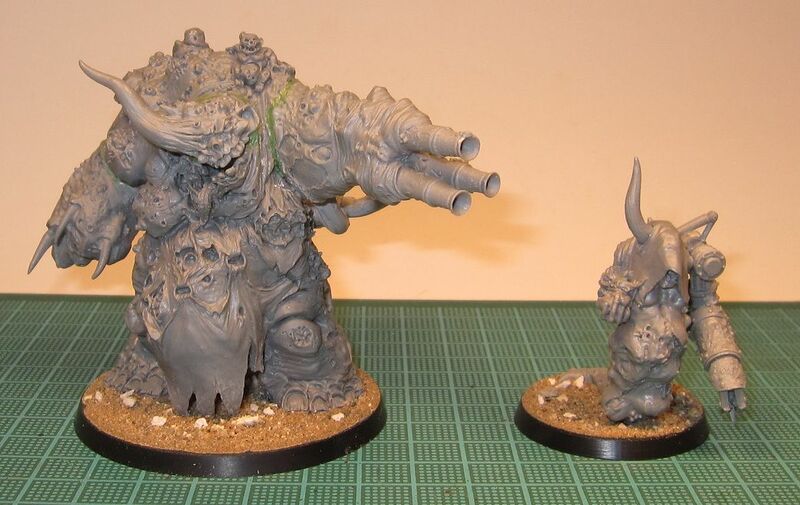 In addition to my Plague Hulk that I am currently working on, I have two partially built Beasts of Nurgle that need building and painting and that will finish off a full unit of seven beasts. Epidemius is partially painted and needs finishing and I have a second Blight Drone to paint. And finally there are 15 more Plaguebearers that are primed and need painting. That is it. While I am eager to start on my Death Guard army, I am going to finish up the following Daemon projects first: Plague Hulk, Blight Drone, Beasts, and Epidemius. It should not take long to finish up these four projects. I rarely need more than the 45 painted Plaguebearers that I already have, so I can hold off on painting the unpainted ones for now. There are a couple other things I did get done this weekend. I primed both my second Blight Drone and my Ork Mega Dread, my 40kFC Painting Challenge Project for the month of October. I plan to start painting these this week. 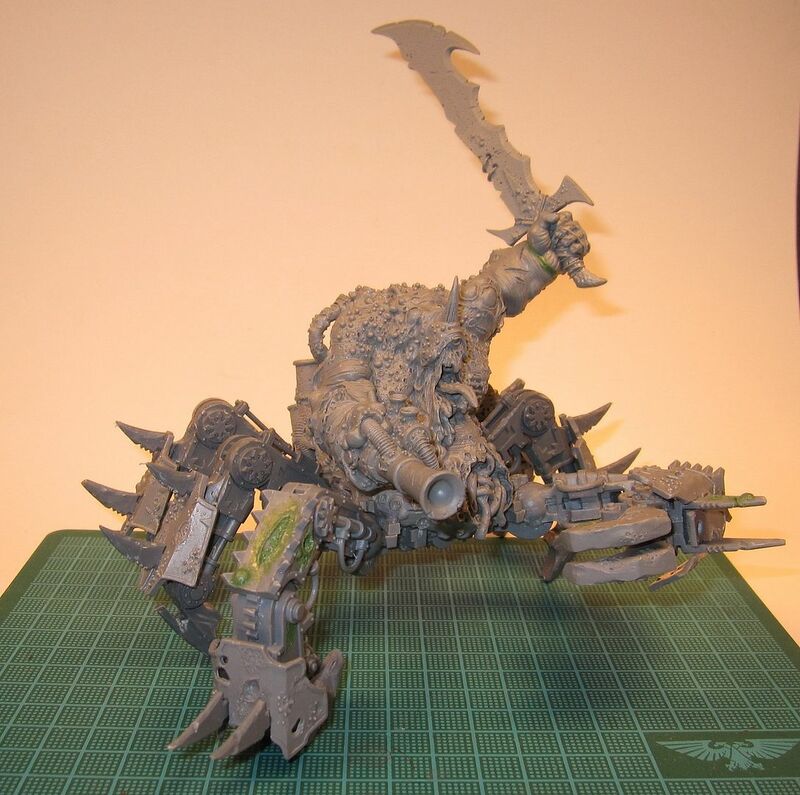 I also got some more work done on my Plague Hulk, mainly on Nurgle-ing up the second front claw arm and getting all the legs and arms attached. I still have a bit more Nurgle-ing to do on the back legs but I think it is coming along very nicely. Here are some new WIP pics. 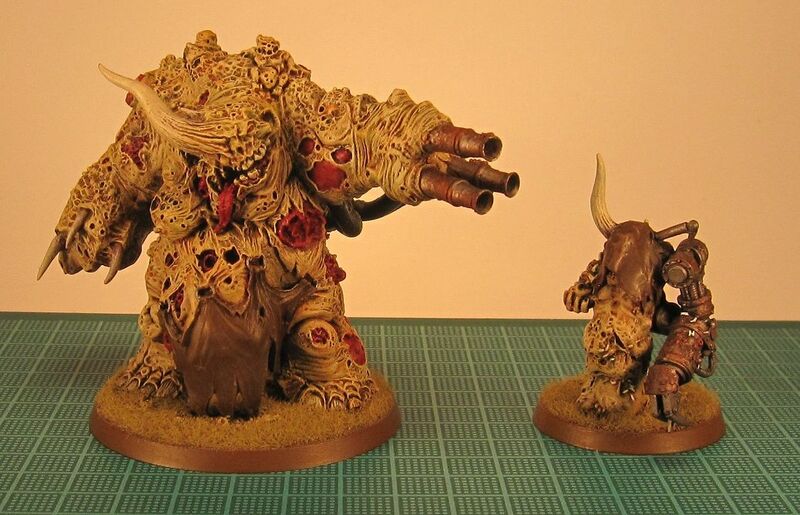 I also want to thank everyone who comment on my last post regarding the Nurgle Daemon Prince. All the comments were helpful and are appreciated. While I have not started on that project yet, lots of good ideas are brewing and I think I will have a good plan for when I start work on it.